One measure of the influence of a man might be considered to be how many others were given his name -- that is to say, his namesakes. By that measure, it would seem Sir John Franklin was a significant figure indeed, one whose name a great number of parents in his day and long after chose to bestow upon their offspring. 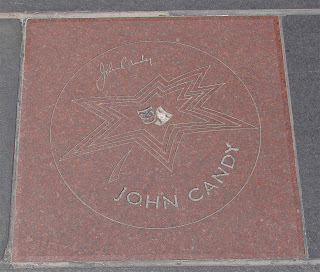 One of those you might least suspect -- the great Canadian comedian John Candy -- was actually given the name John Franklin Candy at birth; the image at left depicts his star in Canada's Walk of Fame. 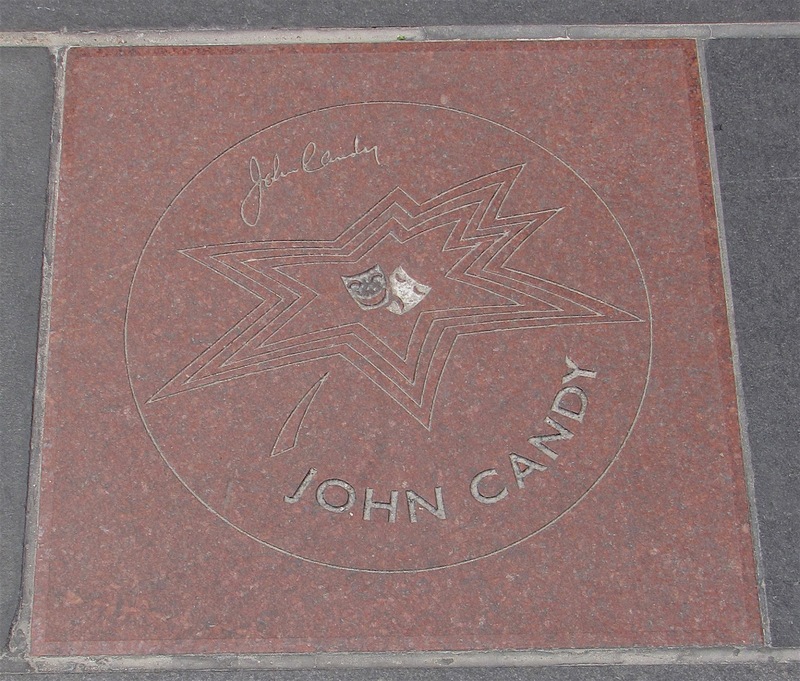 Born in 1950, Candy is actually one of the more recent Franklin namesakes; the name seems to have been at its peak in the mid-to-late 1850's and then again in the 1890's and 1940's. In the account that follows, I should emphasize that I don't actually have any definitive account of the reason for the bestowal of these names, though certainly Franklin's is by far the best known possible source; I've eliminated cases where the name has a family precedent (father or grandfather), along with those who were born too early (prior to Franklin's name becoming well-known around 1818). Among those to bear the name during the early Franklin search era of the 1850's, we have John Franklin Crowell (1857-1931) an early president of Trinity College (now Duke University). That same year, John Franklin Alexander Strong shared an Arctic destiny with his namesake; born in Canada, Strong went on to be just the second Governor of the Alaska Territory. In 1860, John Franklin Kinney, and leading New York Democrat and jurist, was born, and in 1862 we have John Franklin Miller, a member of Congress from Washington, DC. Moving toward the end of the century, we find John Franklin Enders (1897-1985), a pioneering scientist known as the "Father of American Vaccines." The early twentieth century brings us my favorite of all, the novelist John Franklin Bardin, who worked in an advertising agency by day and wrote dark psychological thrillers by night; his novel The Deadly Percheron may be one of the most harrowing, yet whimsical novels ever penned (the name comes from the killer's habit of leaving Percheron horses at the scenes of his crimes; the book is the one being read by Bob Hoskins' character in the film Mona Lisa). A decade later we have the painter John Franklin Koenig, who grew up in Seattle near Lake Union, though he spent much of his artistic career in France. And there may be many more -- the genealogical research site familysearch.org lists tens of thousands of them; even if only a small minority were actually named after our Sir John, it would be a considerable number. We may never know much of the lives of John Franklin Eustace, John Franklin Bainbridge, John Franklin Pollard, or John Franklin Brearly Goodall (this last of whom, like many others, was an Australian) -- but they remain curiously woven together by the thread of Franklin's name. That would indeed, be a project for a statistician - to do that for all the crew that was lost. How many named after Crozier ? After the three buried on Beechey Island ?